Before a person starts to pray, he should place something at a short distance in front of him of the place where he prostrates (does Sajdah). Such an object is called Sutra and is used when the person is spraying alone. A person passing in front of the person in Salat, should pass on the outside of the Sutra. If someone is praying in congregation, then the Imam acts as the Sutra. The Imam, however, must have his own individual Sutra in front of him. Wherever a person is in the world, he should face towards the Kabah when he is going to pray. The Kabah is in the sacred mosque of Makkah in Saudi Arabia. Facing towards Qiblah (Kabah) is a very important condition of performance of Salat. However, if the person is in a place such as a desert, jungle, unknown strange city or a place where he does not know the direction of the Qiblah, he should try his best to find out the direction of Qiblah from others. However, if it is not possible then he should use his judgment and face in a direction which he thinks is that of Qiblah and Allah will accept his Salat. It is important to start the Salat facing the direction of Qiblah and it does not matter if his direction changes while he is praying e.g. in a ship, a train or an airplane, etc. Note: Nowadays, a compass is available which gives the direction of Qiblah. In strange places and airplanes it is a useful instrument to possess. After facing the Qiblah, the person should make Niyah (intention), The intention is made within his mind, so the person should think about the particular obligatory, optional or Nafl prayer he intends to perform. He should not utter the words of Niyah aloud, as this is not authentic or approved by the Prophet (pbuh). After making Niyah the person should start his Salat saying Allah is the greatest, rasing both of his hands to the shoulders, with fingers stretching to the earlobes. he should then fold his hands over his chest right hand over the left hand. This first Allahu Akbar is called Takbir Tahrimah because after saying takbir Tahrimah every common and worldy action, talk or movement is forbidden. Throughout the Salat the eyes of the worshipper should point to the spot where the forehead rests in Sajdah. Some people place their hands under the navel, others place them under the chest but there are Ahadith which state that Prophet Muhammad (pbuh) used to place his hands over his chest. b) Wail bin Hajr said: "I prayed with Prophet Muhammad (pbuh) and he put his right hand over his left hand over his chest." (Ibn Khuzaimah, Abu Dawud, and Muslim). There are some other narrations which state that some Fuqha used to place their hands under the chest but above the navel. Placing the hands in either of these positions is correct but it is better to place them over the chest according to the practice of Prophet Muhammad (pbuh) as mentioned in the above authentic Ahadith. "O Allah set me apart from my sins as east and west are apart from each other." "O Allah cleanse me from my sins as a white garment is cleansed from the dirt after thorough washing." "O Allah, was me off from my sins with water, snow and hail." Glory be to You, O Allah, and all praises are due unto You, and blessed is Your Name and high is Your Majesty and none is worthy of worship but You. A person can read both Du'aa together or just one of them or any of the other Du'aa which are approved by Prophet Muhammad (pbuh), and these are about 7. These Du'aa can be found in different places of several books of Hadith, e.g. Muslim, Tirmidhi, Musnad-e-Imam Ahmad, Abu Dawud, Dar-qutni, Nasai, Ibn Majah, Ibn Hibban and Muatta Imam Malik. All of the 7 Du'aa can be read together before reciting Surah Fatihah. This recitation is called Du'aa-ul-Istiftah which means Du'aa of starting. Du'aa-ul Istiftah should only be recited in the first Rakat. I seek Allah's protection from Satan who is accursed. This should only be said in the first Rakat. In the Name of Allah, the Most Gracious, and the Most Merciful. This should be said in every Rakat before reciting Surah Fatihah. Then the person praying should recite Surah Al Fatihah in Arabic. "Praise is only for Allah, Lord of the universe. The Most Kind, the Most Merciful. The Master of the Day of Judgment. You Alone we worship and to You Alone we pray for help. Show us the straight way. The way of those whom You have blessed. Who have not deserved Your Anger, nor gone astray." Reciting Al Fatihah is so important that Prophet Muhammad (pbuh) said that no prayer was acceptable without the recitation of Fatihah. b) Abu Hurairah reported that Allah's Messenger (pbuh) was saying that anyone who prayed any kind of Salat and did not read in that, Umm-ul-Wuran (and in one version, Fatihah-tul-Kitab), his prayer will be deficient, will be deficient, will be deficient and not complete. (Bukhairi, Muslim, Ahmad). In the light of the above Ahadith we understand that Surah Fatihah must be recited or read in every Rakat of any type of Salat. It is Sunnah to say Ameen when a person finishes recitation of Surah Fatihah. If he is praying alone, he should say Ameen in silence and if he is praying with congregation behind an Imam, then he should say Ameen fairly loudly when the Imam finishes saying the last verse of Surah Fatihah. When saying Ameen, the voice of the whole congregation should resound at the same time. d) Ata said: "I found 200 of the companions praying in the mosque of the Prophet (pbuh) and when the Imam said Walad Daleen, I heard the echo of their voices resound with Ameen. Say: He is Allah, the only One, Allah helps and does not need help. He does not produce a child and He was not born of anyone. There is no one equal to Him. Say: I seek refuge in the Lord of the dawn, form the evil of all that He has created, and from the evil of the darkness of night when it falls, and from the evil of those (charmers) who blow into knots. And from the evil of the envied when he envies. Say: I seek refuge in the Sustainer of mankind. The owner of mankind, Lord of mankind. from the evil of the sneaking whisperer. Who whispers in the hearts of mankind (Whether he be) from among jinni or mankind. "Glory be to my Lord Who is the very Greatest." Ali reported that Allah's Messenger (pbuh) used to read the following Du'aa in Raku: "Oh my Lord, I bowed to You and I believed in You and I submitted to You. You are my Lord. My ear, my sight, my brain, my bones, my tendons and whatever has been carried by my feet is submitted for the Lord of the worlds." (Ahmad, Muslim and Abu Dawud, etc.) There are other Du'aa which Prophet Muhammad (pbuh) read in Ruku and they can be found in other books of Hadith. Perfection of Ruku and Sajdah Abi masud Al Badri reported that Allah's Messenger (pbuh) said: "Allah does not consider the Salat of a man who does not straighten his back when bowing for Ruku and performing Sajdah." (Ibn Khuzaimah, Ibn Hibban and Tabarani) Abi Qatadah reported that Allah's Messenger (pbuh) said: "the worst thief is one who steals in his Salat?" Prophet (pbuh) answered, "he does not complete his Raku and Sajdah with perfection." Or he said, "He does not make his back straight in Ruku and Sajdah." (Ahmed, Tabarani, Ibn Khuzaimah and Hakim) These Ahadith prove that Ruku and Sajdah should be done calmly, slowly and perfectly, otherwise Salat of the person will be deficient. After the pefect Ruku, the person praying should raise his head form Ruku saying: "Verily, Allah listens to one who praises him." and raise his hands up to the level of his shoulders with palms facing outwards and fingers stretched to the earlobes, and then he should lower his hands to his sides. In the standing position, he should be erect so that the joints of his body go back in place. While in this position, he should recite one or all of the following Du'aa as many times as he likes. a) "Oh, our Lord, all the praises be to You." b) "Oh, our Lord, All praises be to You, very many, pure and blessed praises be to You." c) Abu Saeed Al Khudree says that when Allah's Messenger (pbuh) used to say: "Oh Allah, our Lord, all praises be to You, as much as they can fill the heavens and the earth and everything which You want to be filled after that. You deserve to be praised and glorified. You deserve more than what Your servant has said and all of us are Your slaves. Nobody can prevent whatever You want to give and nobody can give whatever You want to prevent and a person with high rank cannot benefit himself or another from his high rank against Your will. " there are some other Du'aa which can be read in the Qawmah position and these can be found in other books of Hadith. 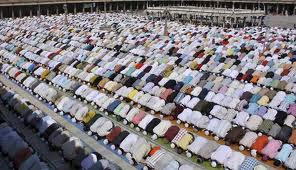 After the perfect Qawmah the person praying should move to perform Sajdah saying: "Allahu akbar" putting palms downwards on the ground below the ears. The knees should be brought downwards on the ground. His fingers and toes should be pointing towards Qiblah without spreading the fingers of the hands. During prostration seven parts of the body should touch the ground. (i) The forehead along with the tip of the nose (ii) both hands (iii) both knees (iv) the bottom surface of the toes of both feet. In this position, he should say "Oh, Allah, glory be to You, the Most High." He should say this at least 3 times or 5, 7, 9,11 etc. times. There are some other Du'aa which can be read in the Sajdah position. i) Ali said that Allah's Messenger (pbuh) used to say while doing Sajdah: "Oh Allah, for You I have prostrated, and in You I have faith, and unto You I have submitted, my forehead has prostrated in front of one Who created it and gave shape to it and made it perfectly. Then He gave power of hearing and sight, and blessed is Allah's Name Who is the Perfect Creator." (Ahmad and Muslim) ii) Abu Hurairah said that Allah's Messenger (pbuh) used to say in his Sajdah: "Oh Allah, forgive all of my sins, minor ones and major ones, ones I committed previously and ones I commit in the future, ones I commit openly and ones I commit secretly." (Muslim , Abu Dawud and Hakim) There are some other Du'aa which Allah's Messenger (pbuh) used to say in his Sajdah but these Du'aa are too long to mention here. They can be found in authentic books of Hadith like Muslim, Ahmad, Nasai, Abu Dawud etc. It is not surprising that Prophet Muhammad (pbuh) stayed in Ruku and Sajdah for long intervals. All of the authentically approved Du'aa can be said with Subhana Rabbi yal ala or on their own or altogether according to the time available and capacity of the person. In Sajdah position the worshipper is at his closest to Allah. Hence, Sajdah should be performed calmly, and quietly, without fidgeting, and the worshipper should try to read as many Du'aa as he possible can. After performing one Sajdah perfectly and calmly, the person praying should raise his head form Sajdah saying "Allahu Akbar" bending the left foot and sitting on it while keeping the right foot propped up with its toes pointing towards the Qiblah, the palms of his hands should rest on his thighs and knees, the back should be straight so that the joints go back in place. It is sunnat to say the following Du'aa while sitting in between the two Sajdah: "Oh, Allah, forgive me, and have mercy on me, and keep me on the right path, and keep me healthy, and provide me with Halal sources of living and complete my shortcomings and make my rank high." The worshipper can say this Du'aa once or as many times as he likes. Then the person should perform the second Sajdah saying "Allah Akbar" and repeat what he did in the first Sajdah. Then he should raise his head up saying "Allahu Akbar" and sit for a short while as he did in Jalsah. He does this before standing up for the second Rakat. After standing up for the second Rakaat, he should fold his hands over his chest as he did in the first Rakaat and start his recitation by reading "Bismillah..and Surah Fatihah followed by any passage or a chapter of the holy Quran." Then he should complete his second Rakaat in the manner of the first one. While choosing a passage or a chapter for the recitation in the second or a subsequent Rakaat, the worshipper should observe the order in which they occur in the Holy Quran. Also, each surah or verse should be shorter than the one recited before it. Hence, longer Surah are recited before shorter Surah. "Oh Allah, send grace and honor on Muhammad (pbuh) and on the family and true followers of Muhammad (pbuh), just as You sent grace and honor on Ibrahim and on the family and true followers of Ibrahim. surely, You are Praiseworthy, the Great." "Oh, Allah, send Your blessings on Muhammad (pbuh) and the true followers of Muhammad (pbuh), just as You sent blessings on Ibrahim and his true followers. Surely, You are Praiseworthy, the Great." There are quite a lot of Du'aa which Prophet (pbuh) used to say after Darud and he taught them to the companions. Here we will mention a few of them: i) Abdullah bin Amr said that Abu Bakr said to Allah's Messenger, "Please teach me a Du'aa so I can say it in my Salat". So, Allah's Messenger (pbuh) said, "Say "Oh Allah, I have been very cruel to myself (by ignoring my duty to You) and there is no one who can forgive the sins except You. so forgive me because You are the only Forgiver and have mercy on me. Verily, You are the Forgiver and Merciful." ii) Shaddad bin Aus reported that the Prophet of Allah used to say in his Salat : "Oh Allah, I ask You for strength in every matter of Deen and a strong will power to be on the right path. And I ask You to make me thankful for Your bounties and give me ability to worship You perfectly. And I ask You to make my heart sincere and my tongue truthful. I ask You for every goodness known to You and I seek refuge in You from everything bad that You know is bad. I ask Your forgiveness for all mistakes You know." (Nasai) iii) Aisha reported that the Prophet (pbuh) used to say this Du'aa in his Salat: "Oh Allah I seek refuge in You from the punishment of the grave, and I seek refuge in You from the troubles of Daj-jal, and I seek refuge in You from the difficulties and troubles of the life and death. Oh Allah, I seek refuge in You from every kind of sin and unexpected troubles." "Oh Lord, make me and my children keep up Salat. Our Lord, accept our Du'aa. Our Lord, forgive me and my parents and all the believers on the Day of Judgement." Although most people read Rab bijalnee after Darud; it is permitted to recite any nice Du'aa. However, it should be known that this Du'aa is not one of those Du'aa which Prophet (pbuh) used to say after Darud. It is preferable to read both Rab bijalnee and the Du'aa which are authentically proved from the Prophet (pbuh) and those he taught to his companions. we have mentioned only four but there are about twelve. However, they are too lengthy to mention here. After praying for himself as much as the person wishes, he should end his Salat saying: "Peace be on you and the Mercy of Allah." turning the face first to the right and then to the left, both times over the shoulder. This brings the two, three or four Rakaat of the Salat to completion. There are many Du'aa which Prophet Muhammad (pbuh) used to say after salutation. So, a person praying should try to memorize them and follow the practice of Prophet Muhammad (pbuh). Some of these Du'aa we will mention here: It was the continuous practice of Prophet Muhammad (pbuh) when he turned away from his Salat to say: 1. a) Allahu Akbar (once aloud) Allah is the greatest. b) I ask Allah to forgive me (3 times) c) Oh Allah, You are the peace and You are the source of peace, You are blessed, O Possessor of glory and honor. (Muslim) 2. Oh Allah, help me to remember You all the time, And to thank You and to worship You perfectly. 3. There is no God but Allah, He is the only One and has no partner, sovereignty and praise are only for Him, and He has full authority over everything. Nobody can prevent whatever You want to give and nobody can give whatever You want to prevent and a person with high rank cannot benefit himself or another from his high rank against Your will. (Bukhair, Muslim) 4. It is Sunnat to say: Glory be to Allah (33 times) Praise be to Allah (33 times) Allah is the Greatest (34 times) There are very many Du'aa which Prophet Muhammad (pbuh) used to say and he taught them to his companions. These can be found in famous books of Hadith.